Hello Friends, Watch Yummy Maggi Noodles Eating Challenge and enjoy Noodles Eating Challenge, 10 Vegetable Maggi Spicy Noodles till the end for Bollywood style Punishment. 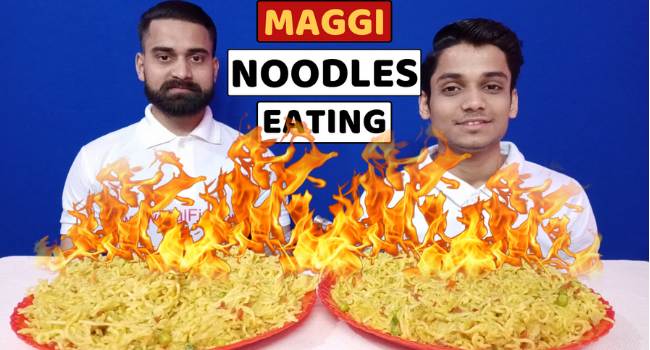 In this video, Me (Ashish) and My Big Brother (Ankur) are trying to entertain you by Maggi Noodles Eating Challenge. Hope you will like this Noodles Eating Challenge. COMMENT BELOW Which noodle you like the most and use to eat with your brother or friends. KEEP WATCHING FULL competition FOR Bollywood mimicry Punishment. Most of the people love Maggi noodles, almost all. We both also love noodles like chow mein, Maggi noodles, masala noodles, etc. Stay connected with #KulFiy. Hit the LIKE BUTTON, SHARE with your Friends on Whatsapp, Facebook & Other Social Networks. This Channel Does Not Promote Any illegal content, all contents provided by This Channel is meant for Entertainment purpose only and does not intend to give any financial advice. The content on this channel does not intend to mislead the viewers. About KulFiy Food Channel: Watch Yummy, Tasty, Delicious, Interesting Food Challenges in India, Eating Food Challenge Videos on KulFiy.com Food YouTube Channel. Amazing Experience to Make Yummy, Tasty Food Videos.